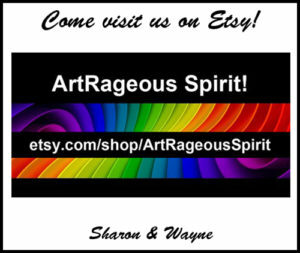 The Search for Mary (Polly) | Simply Art-Rageous! ← And Just How Windy Was It?! 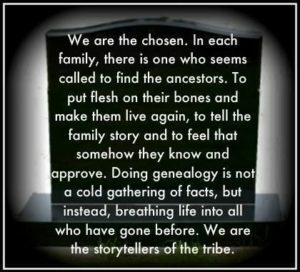 Long before I was interested in genealogy, two of my uncles, Billy and Buster, tried to learn more about our family’s history. 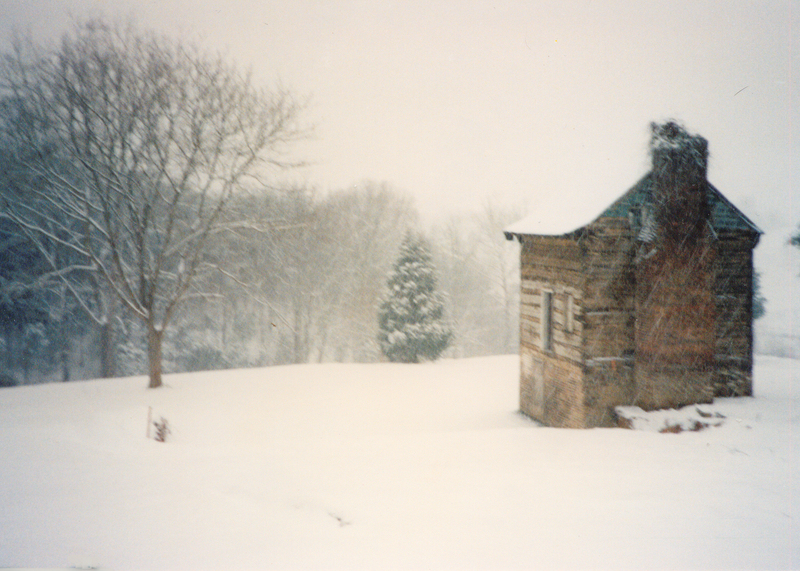 There were tales about Mary “Polly,” the unwed mother of our family patriarch (John William Anderson, June 24, 1826 – Nov. 11, 1902) “arriving” in Nelson County, Virginia driving a buckboard wagon with her young son in tow. Some older family members thought she came from Fluvanna County. They knew she later married a Fox. 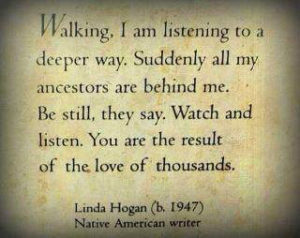 Despite their research, my uncles could never discover much about her origins, and these tales were all I had to go on when I seriously began researching in 1990. 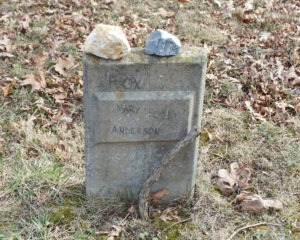 Unfortunately, there are some things I will never be able to find out about the life of Mary “Polly” Anderson Fox, but thanks to courthouse records and genealogy forums on the internet, I have been able to piece together some interesting facts about our elusive great-great-great grandmother. 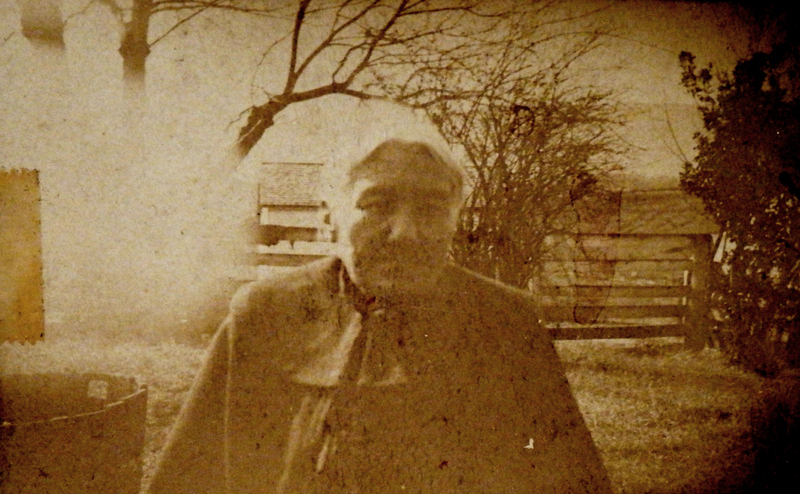 When her son, John William Anderson, was born in June 1826, Mary was just sixteen years old. Did she name him after her father and maternal grandfather? Possibly, but there’s no way to know for sure. Neither will we ever know the name of her child’s father (she used her surname–Anderson–as his last name), or under what circumstances she became pregnant at the age of 15…. I do know that when Mary’s maternal grandfather (William Lyon) died in 1811, he specified in his will that what he was leaving to Mary’s mother was not subject to “the controul or paiment of the debts of her husband John Anderson,” and he appointed one of his sons as a trustee to enforce this. Therefore, it would seem that there was some friction between Mary’s parents–or at least between her father and her maternal grandfather. 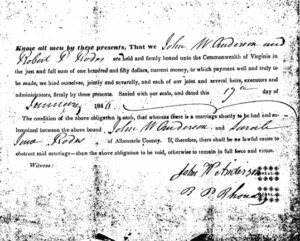 In August 1829, at the age of 19, Mary “Polly” Anderson married Woodson B. Fox in Nelson County, Virginia. Woodson was the son of Samuel A. Fox, Jr. and Elizabeth “Betsy” McGuiry Fox. 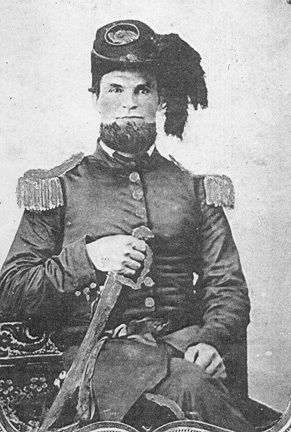 His parents lived on land along current day Rt. 151 between Afton and Greenfield in Nelson County. 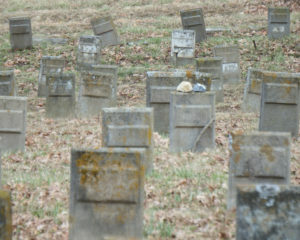 Very early in my research, I investigated a small cemetery in this area. If I took pictures, they were probably lost in (one of several) computer crashes in the early 1990s, but from what I remember, most of the graves were marked with simple stones. 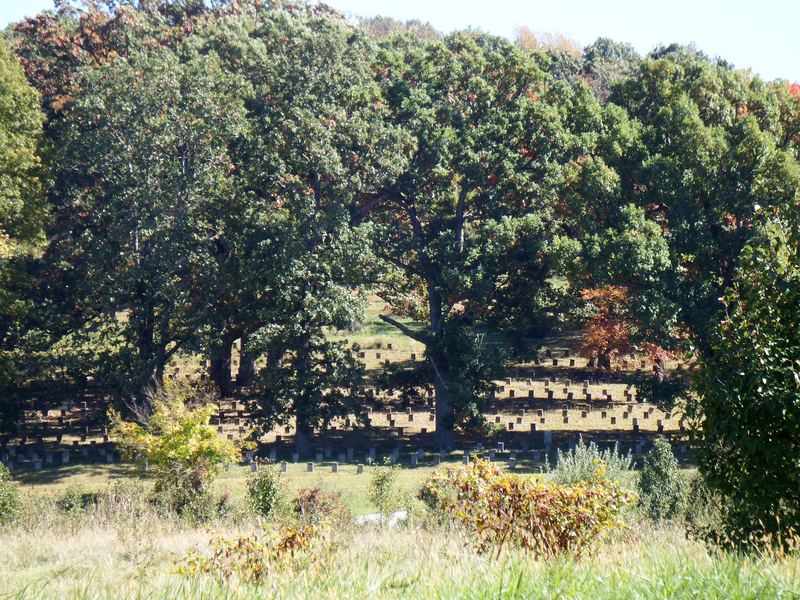 During a later trip into Nelson County, I was shocked to see construction occurring in the field where the cemetery had been, and before long there was an Italian restaurant (D’Ambola’s) and parking lot there! While I don’t think it includes the names of all who were buried there, at least they made the effort to remember them. And as a side note, in 2006 my mother and I got together at the restaurant with an Anderson relative I initially met through genealogy. We figured that it was a rather appropriate spot to have a mini-reunion! In 2011, The Blue Toad Restaurant opened in what had been D’Ambola’s. I don’t know if Woodson and Mary lived on this land with or near his parents, and early census records provided very little information. For example, the 1830 U.S. Federal Census showed Woodson living in Nelson County with a female household member (“total free white persons – 2”), but where was her son? John William Anderson would have been about 4 years old then. 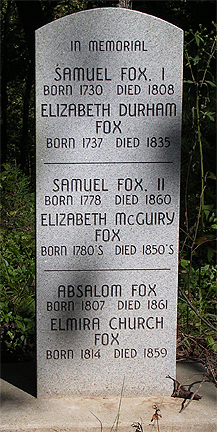 In March 1831, Mary and Woodson had a daughter, Elizabeth Ann “Betty” Fox. I think it is safe to say that she was named after Woodson’s mother, Elizabeth “Betsy” McGuiry Fox. In the 1840 U.S. census, the Woodson B. 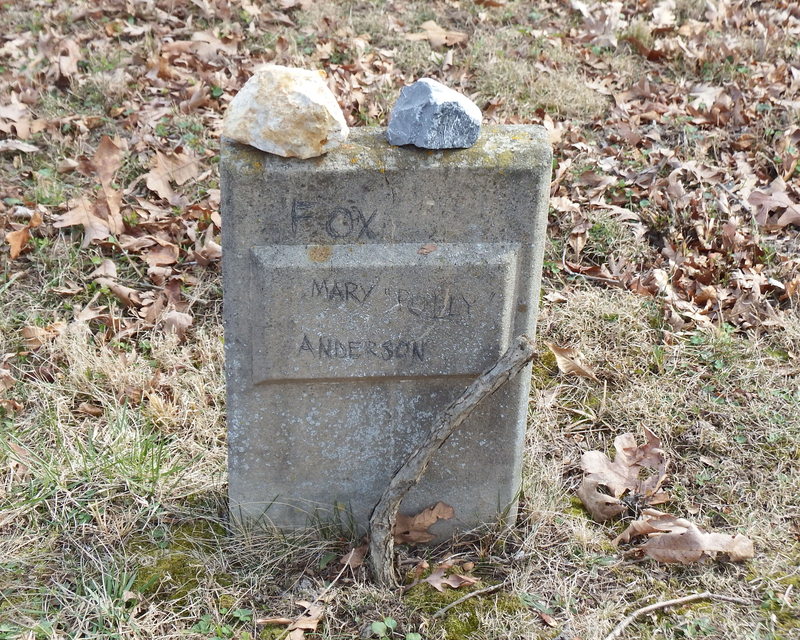 Fox household was comprised of one male 40-49 (Woodson), one male 10-14 (most likely John William Anderson), one female 30-39 (Mary), and one female 10-14 (most likely their daughter, Elizabeth Ann, aka Betty). 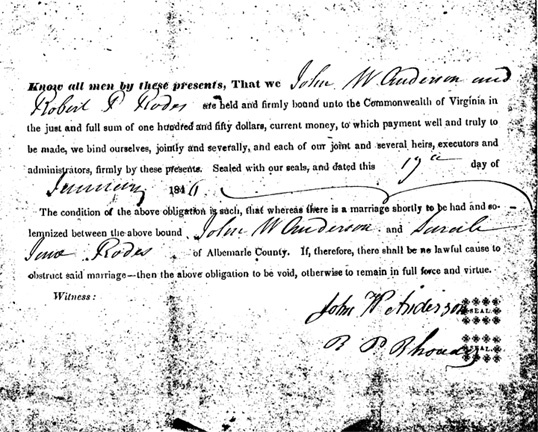 In 1846, Mary’s son, John William Anderson, married Sarah Jane Rhodes of Nelson County. 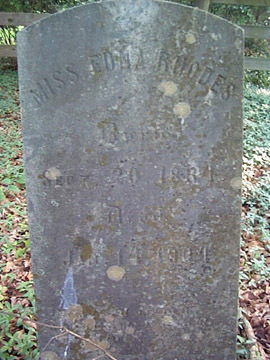 She was the daughter of Robert P. Rhodes and Mildred Marshall Rhodes who lived in the Rockfish area of the County, within a couple of miles of the Rockfish Depot. 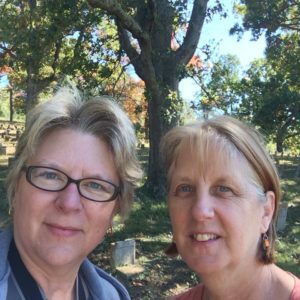 Their marriage license was registered in Albemarle County. While no military records have been found for John William Anderson, there is a picture of him in a pre-Civil War uniform. According to sources at the Civil War Museum in Richmond, Virginia, this was the uniform of an officer. The 1850 census provided more information about these families, including household members’ names. Woodson’s occupation was listed as mechanic, and he was 45 years old. Mary was listed as 40 years old, and their daughter, Elizabeth Ann (Betty) was 20. In 1850, Mary’s son and his family were living next to a Clemons (sp?) family who were millwrights. At one point a mill was on the creek behind the house that became our “home place,” and the mill stones are now on the adjacent property where John William Anderson lived. 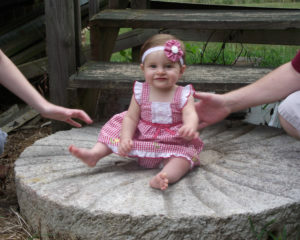 During our 2011 family reunion, my cousin took this picture of her young granddaughter sitting on one of the millstones. As children, we would often find horseshoes in the dirt at the intersection of Batesville Road and Ennis Mountain Road, so this was probably the site of JWA’s blacksmith shop. 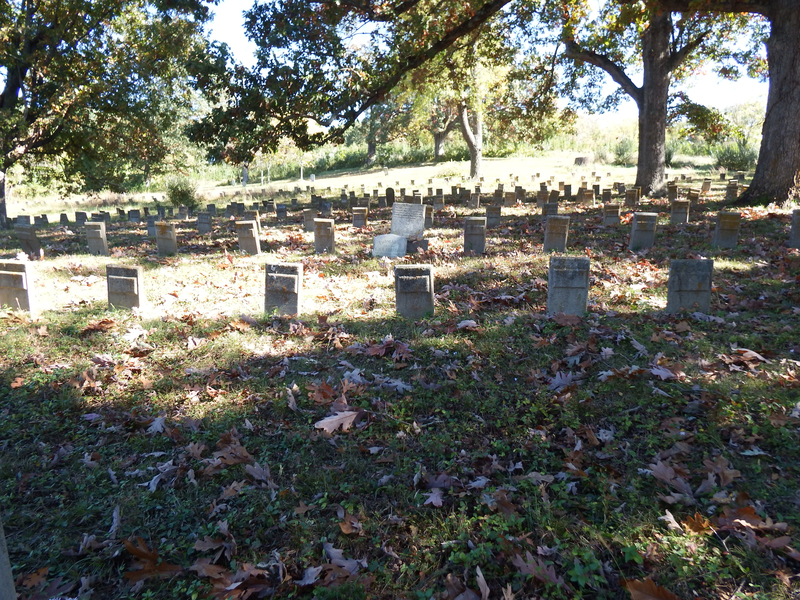 On April 17, 1861, Mary’s son-in-law, William Hicks, went to North Garden, VA and enlisted in Company F of the VA 10th Cavalry, Regiment 17. 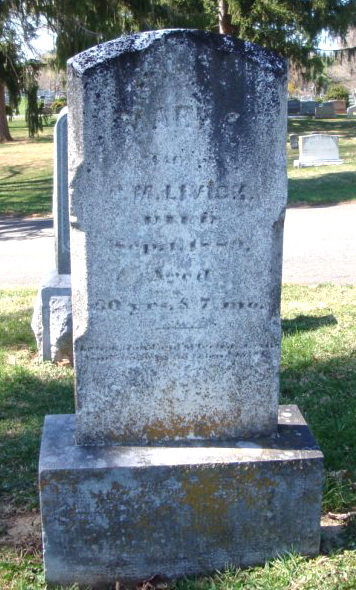 Sadly, he died at the Winder Hospital in Richmond, VA on July 10, 1862, leaving behind his wife and two daughters. 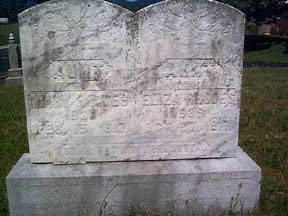 In April 1867, Elizabeth Ann (Betty), now 36 years old, married Cornelius S. Foley in Nelson County. Foley, born in County Cork Ireland, was the son of William and Margaret Foley. I haven’t been able to conclusively find anything about Cornelius and Betty after their marriage. 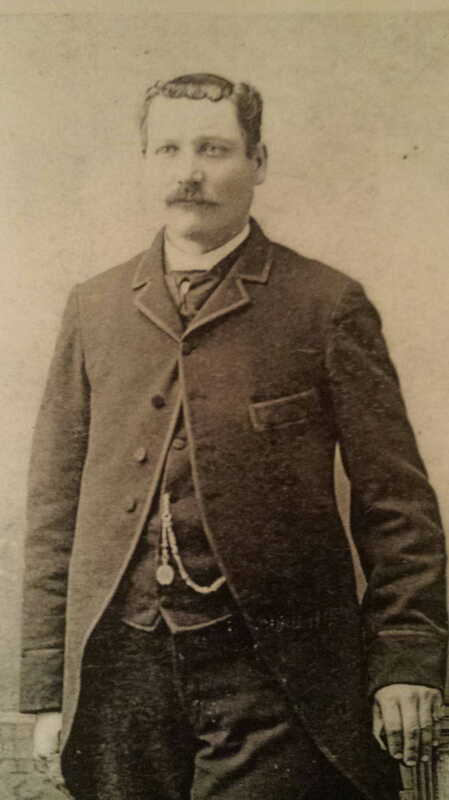 Oddly, Cornelius Foley was a common name for Irish immigrants, so while there are records of men bearing the name all over the east coast, I can’t prove that any are the one I’m looking for. Three years later, the 1870 U.S. Federal Census was full of surprises: John William Anderson, his wife, and their five (surviving) children were visited by the census taker on September 15, 1870. In the very next household visited (in a separate dwelling), his mother, Mary Fox, age 61, was “keeping house,” along with her granddaughters Ella and Mary. 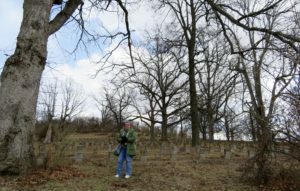 Also listed in the household was John Fox, age 21, whose occupation was “farm laborer.” There was no mention of her husband, Woodson, and no mention of her daughter or new son-in-law, Cornelius. This makes me think that Betty left the area with her new husband, entrusting her daughters’ care to her (widowed) mother…. Ella was married just two months later, in November 1870, to John Edward Hall, the son of Hugh Nelson Hall and Eliza Ellen Wallace. Their marriage license was issued in Nelson County, Virginia. In July 1872, however, John Edward Hall–listed as a widower–married K. (Catherine) Kilbourne. 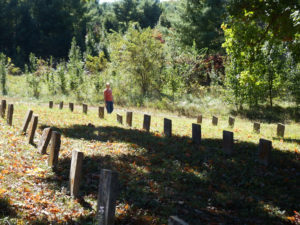 John Edward Hall and his second wife Catherine are both buried at Hebron Baptist Church in Nelson County, Virginia, but the grave of his first wife, Ella Hicks Hall, has not been found. It’s possible that she was buried in Hilltop Cemetery (where her uncle John William Anderson was later buried), but I have not seen/found a grave that would indicate that. 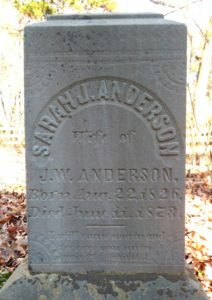 In June 1873, Sarah Jane Rhodes Anderson, the wife of John William Anderson, died at the age of 46. 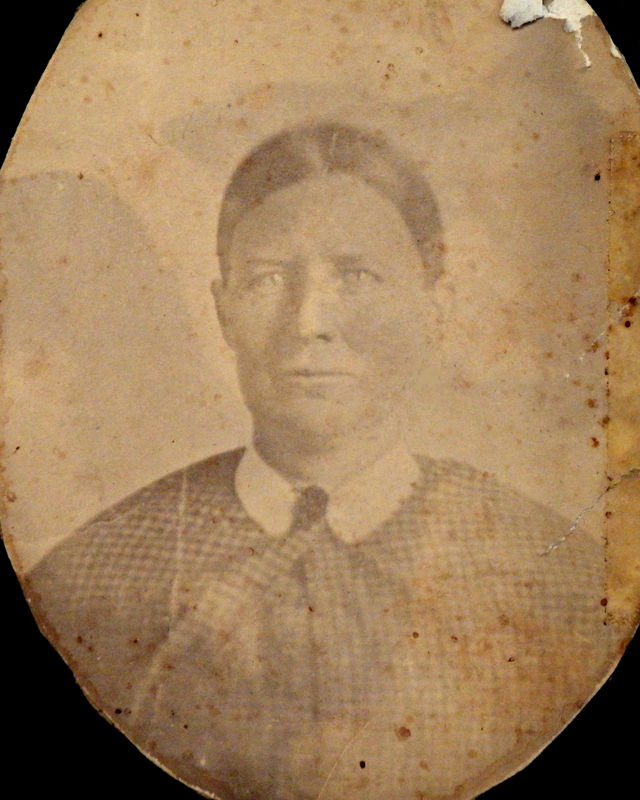 At some point after that (but certainly by 1880), two of Sarah’s unmarried sisters had moved in with JWA and his three sons who were still living at home. As a side note, John William Anderson apparently had much love and respect for his sisters-in-law, and in his will, he outlined how they should be cared for after his death. The only picture I have of these women is one of “Aunt Fanny” (Cynthia Frances Rhodes). 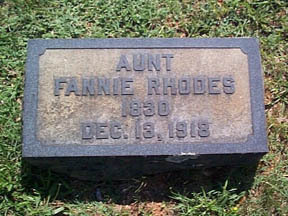 Fanny was buried in the Hebron Baptist Church cemetery. 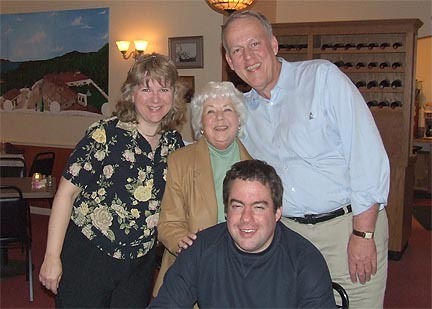 The other sister who helped care for JWA and his family after Sarah’s death was Cornelia Edna Rhodes. 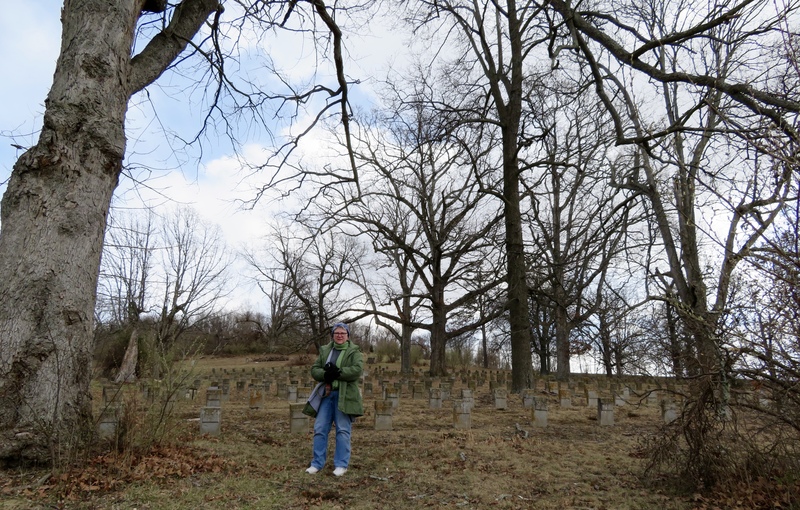 She was buried in Hilltop Cemetery near her sister’s grave. 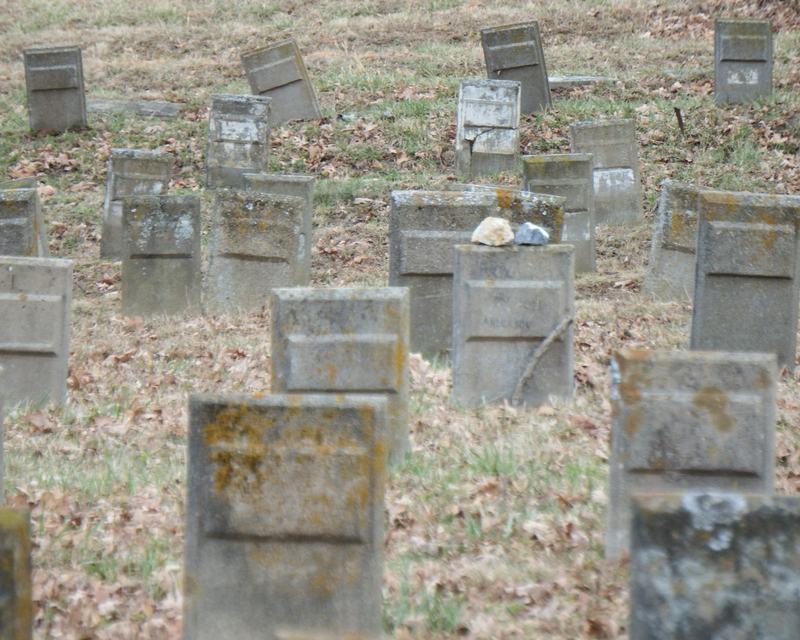 Two more of Sarah’s sisters, Mary and Eliza, were buried at Hebron Baptist Church. 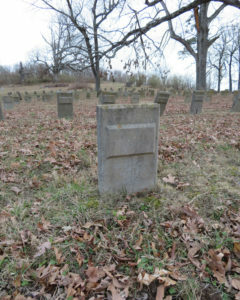 It’s hard to tell exactly what happened after Sarah’s death in 1873, but on Tuesday, December 9, 1879–just days before her 70th birthday–Mary “Polly” Anderson Fox was admitted to Western State Lunatic Asylum in Staunton, VA. (The name wasn’t changed to Western State Hospital until 1894.) The reason for her admission was “paralysis with a duration of two years,” and she was listed as a pauper. She lived less than 6 weeks after her admission to the hospital, and died on Sunday, January 25, 1880. But if Mary had a significant stroke sometime around 1877, who cared for her during those two years–her teenage granddaughter Mary/Mollie? Her son’s sisters-in-law? Was Mary still living in a house near her son? I first learned that Mary “Polly” Anderson Fox was buried in the Western State Hospital cemetery in September 2015, and on October 12, 2015, my cousin Mary and I went over to see what we could find. Simply put, it was overwhelming…. 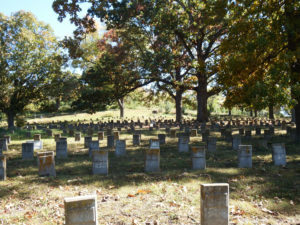 Over 2000 men and women are buried there. In an effort to protect their privacy, the headstones were originally painted with a code number, but the paint has wore off, leaving literally thousands and thousands of anonymous, impersonal unmarked graves. 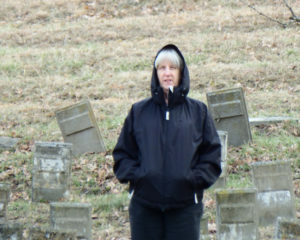 A few graves have proper headstones, with the decedent’s name and dates on them, and my goal–since learning of my great-great-great grandmother’s burial there–has been to put up a tombstone for her, if we could ever positively identify her grave. On this day in October 2015, however, my cousin and I came away with many pictures, but with no answers. Shortly after our visit, my cousin noticed that the plot location was noted on the cemetery listing for our ancestor: https://www.findagrave.com/memorial/42273325/mary-fox. According to records, she was buried in Terrace Row 9, Plot 27. 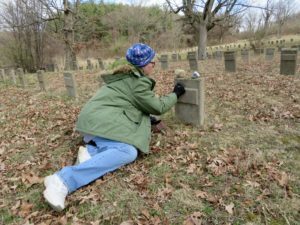 This was certainly helpful, but it still wouldn’t absolutely guarantee that we would be able to find her grave among the thousands. 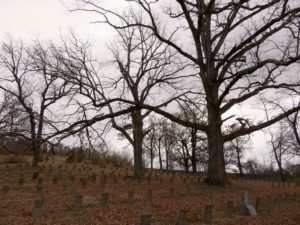 So many markers have fallen or are broken, and there are trees growing up through some graves–how could we know for sure? 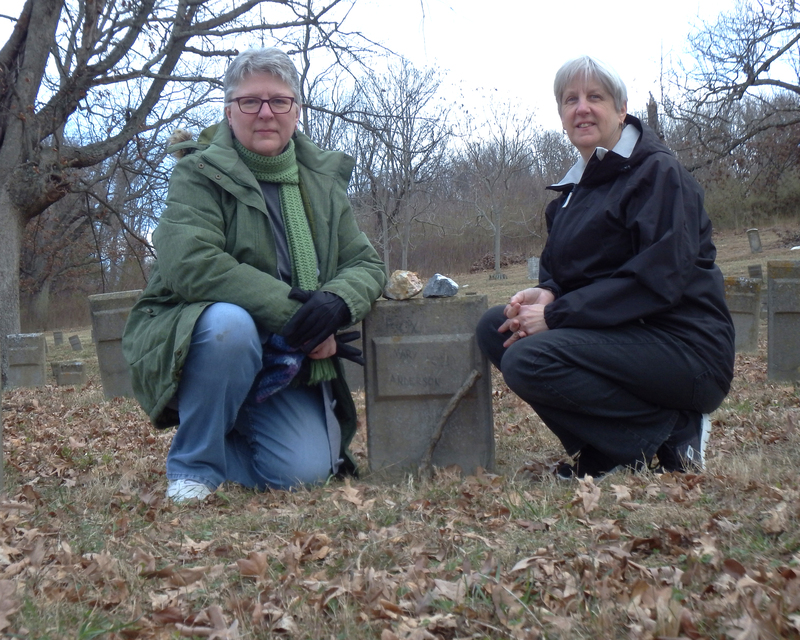 It took us over 2 years to return, but on March 8, 2018 we went back to the Western State Hospital Cemetery in Staunton. It was in the mid-30’s and windy–and spitting snow!–when we arrived, but we were (almost) dressed warmly enough to begin our search. 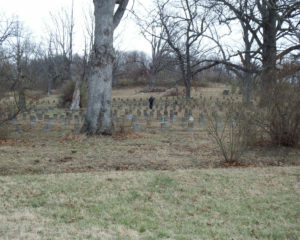 Starting with row 1, we walked up the side of the cemetery to row 9. 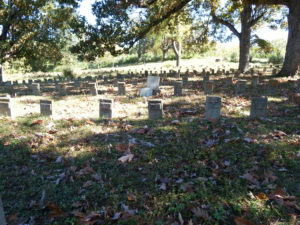 The first grave marker in the row had fallen over, but the rest of the markers were standing or clearly visible in the line. 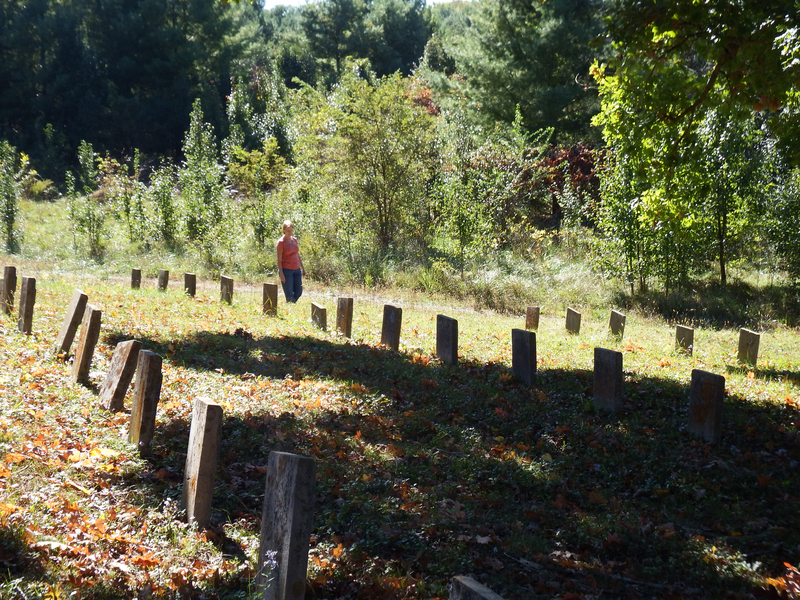 And so we counted across to the 27th stone, which should be the plot where our ggg-grandmother was buried 138 years ago…. I picked up a couple of rocks at the edge of the parking lot, and instead of walking straight up the hill, I again started at the side. Once again I counted 9 rows up and 27 over just to verify that we were in the right place. It was surprisingly difficult to write on the lichen-encrusted concrete marker–the leads in my mechanical pencils broke after every mark–and what I wrote was off-center and crooked. 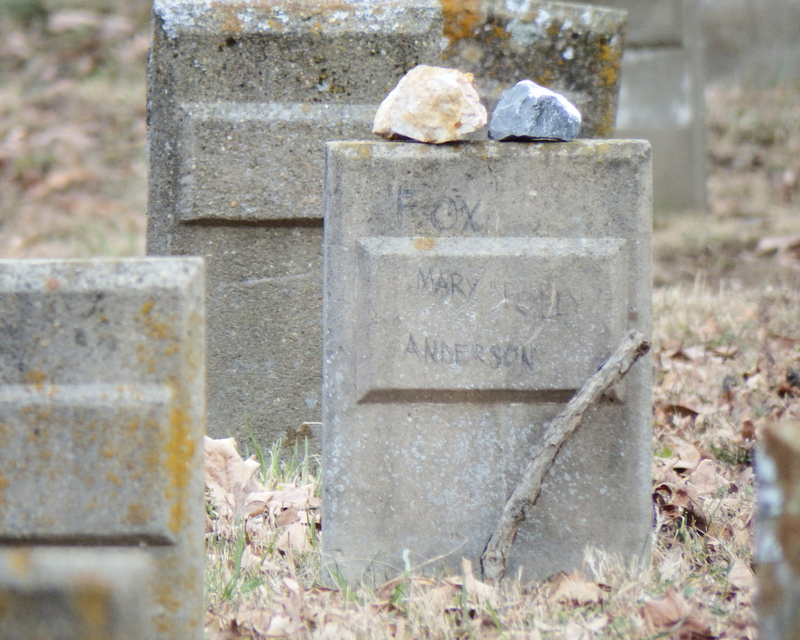 But by getting something written on the marker, and by placing the two rocks on top of it and a stick in front of it, we had at least a temporary way to identify what we believed to be Mary “Polly” Anderson Fox’s grave. 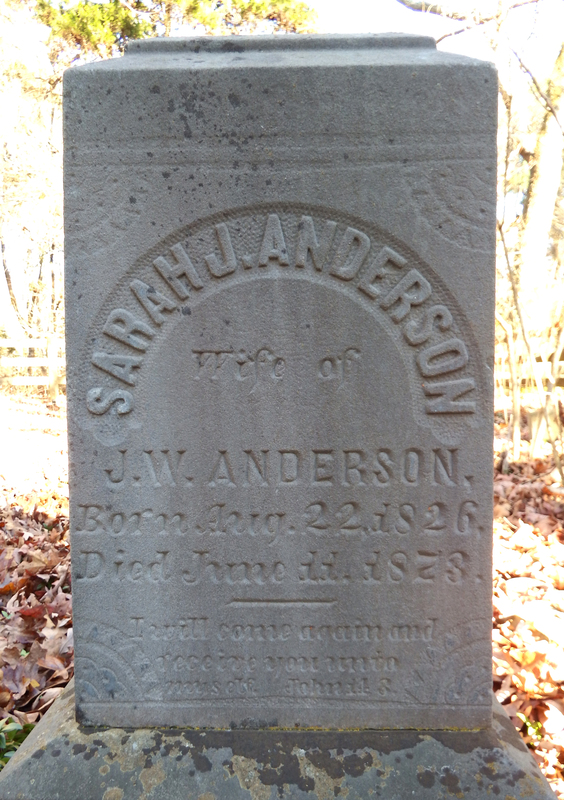 One has to wonder why Mary’s son, John William Anderson, did not bring his mother back to be buried in the small family cemetery where his wife and some of his children were buried. According to a Staunton newspaper from January 1880, it was unseasonably mild about the time of her death, so weather should not have been an issue. Was there a funeral? Did any of her family members attend? 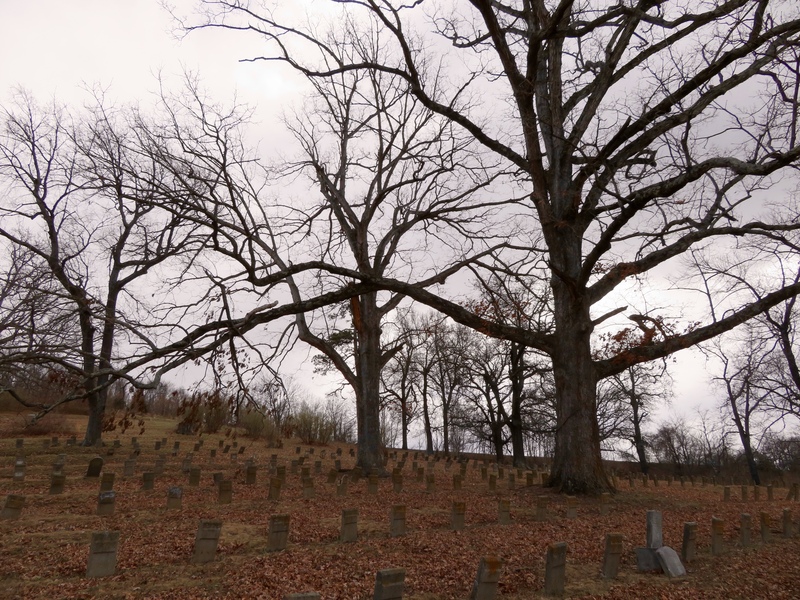 Were funerals even held for patients at the Western State Lunatic Asylum, or were the dead carried out under cover of darkness and quietly buried so as to not disturb the other patients? Were flowers ever put on her grave? She was 24 years old and single, and her husband was also single (first marriage for both) and he was 26 years old. On their marriage license, Mary/Mollie’s parents were listed as William C. Hicks and Betty Fox. Mollie and Peter had two daughters, and their first daughter, Cora Lee, was born in February 1885–less than two months after they were married! Their second daughter, Edna May, was born in September 1888, and Mollie died on September 1, 1889, two days before her daughter’s first birthday…. Mary “Mollie” Hicks Livick was buried in Thornrose Cemetery in Staunton. I hope to find and photograph her grave as time permits. Someone sent me this picture, but I can’t remember who. 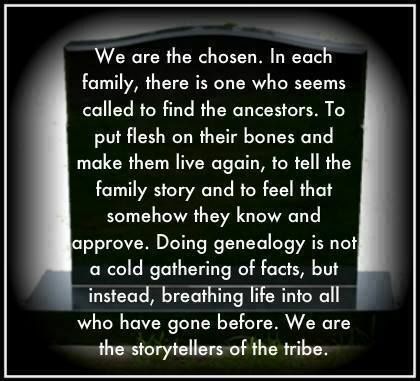 But since it’s from the findagrave site, maybe I got it from there. Both Cora and Edna–daughters of Mary “Mollie” Hicks Livick, granddaughters of Elizabeth Ann “Betty” Fox, and great-granddaughters of Mary “Polly” Anderson Fox–went on to marry and have children of their own, as did the children of John William Anderson. It is mind-boggling to think of how many people could (in the past) and can (right now) trace their ancestry back to our great-great-great-grandmother, Mary “Polly” Anderson Fox. She deserves to be remembered. 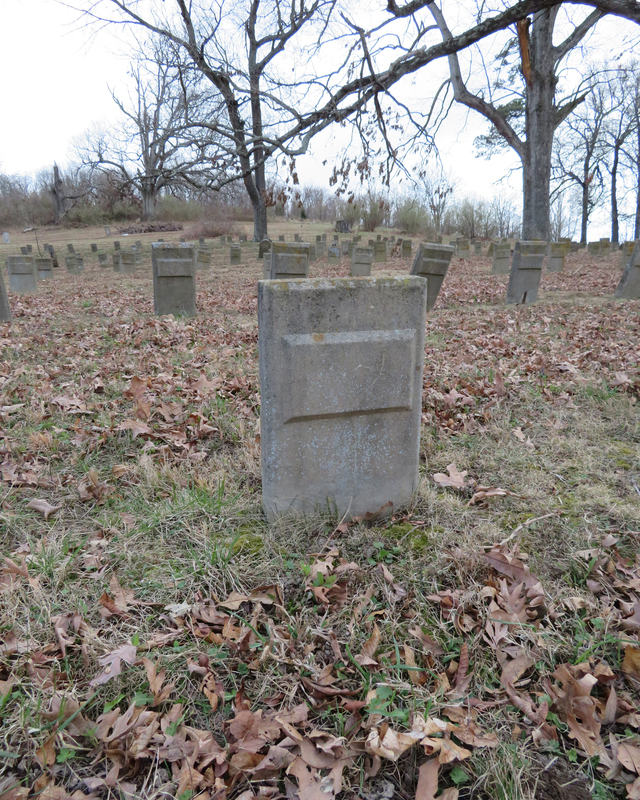 I have left messages for the Community Affairs representative at Western State Hospital and hope to set up an appointment to see the actual cemetery ledgers. The information there should positively confirm that Terrace Row 9, Plot 27 is the final resting place of our elusive Mary/Polly–long sought, now most likely found. This entry was posted in Genealogy and tagged Anderson, Cemetery, family history, Fox, genealogy, Hicks, Livick, Lyon, Rhodes, Staunton, Virginia, Western State Hospital. Bookmark the permalink. I’m sure Mary Polly is tickled that you girls, her girls, have found her. Thank you for this wonderful addition to our Anderson family lore. I hope that you and Mary can continue on the trail and get some answers. I’m a distant relative, another amateur genealogist, who lives for stories like this. Thank you so much for sharing your travels with us.